Nick Elmi's ITV on East Passyunk Avenue has undergone a holiday makeover. Through Saturday, Dec. 23, stop in for a festive drink at the pop-up Miracle bar. Fifty other locations around the world are also hosting pop-up Miracle bars this holiday season, but ITV is the only one in Philly. Each pop-up will serve the same list of "holiday cheer." 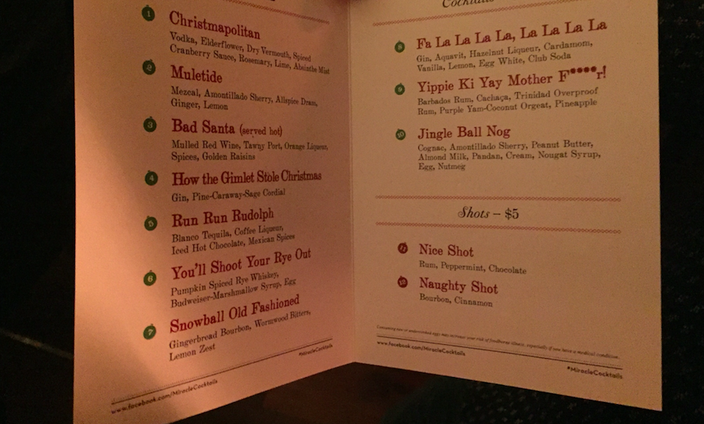 Whether in Philly or Paris or Panama City, you'll find the Snowball Old-Fashioned, The Gimlet Stole Christmas and Run Run Rudolph on the menu. Guest bartenders from establishments in Philly, New York, Lancaster and Baltimore will be mixing the craft cocktails at ITV. Each day there will also be a special, festive concoction, unique to Philly's Miracle bar. Check ITV's Instagram to find out what it is each day. Something else special ITV is doing is hosting a gingerbread house-building contest on Tuesday, Dec. 19. Then, to close out Miracle, there will be an ugly sweater party on Saturday, Dec. 23. ITV's kitchen will be serving Chinese food for the occasion. The bar is open 5 p.m. to 1 a.m. Mondays through Thursdays and open until 2 a.m. on Fridays and Saturdays.